Lee Baumgartner is a Freshwater Fish Ecologist who designs, supervises and undertakes into various aspects of the biology and ecology of freshwater fish. His research has been in several broad areas, including fish passage and fish migration, dietary interactions among native fish species, the impact of human disturbance on aquatic ecosystems and, more recently, the effectiveness of native fish stocking. 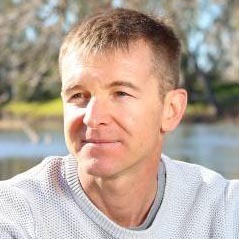 Dr Baumgartners' work has also focused on developing innovative methods for assessment (such as the adaptation of sonar technology to for migration studies) and improving existing fish collection techniques. Much of his work is applied and has fed back into adaptive management strategies which have resulted in state and national policy development. Recently, he has been involved in research activities in the lower Mekong Basin; specifically understanding mechanisms to help fisheries recover from human disturbance and quantifying the value of fish in a food security context. Australian Society for Fish Biology (NSW Representative); American Fisheries Society (member); Association of Power Biologists (member); Fish Passage Task Force (member); Murray Cod Fishery Management Group (member); International Energy Agency Fish and Hydropower Annexe (member); IUCN Freshwater Fish Specialists Group (member); North East Catchment Management Authority(board member). Marine & Freshwater Research (Associate Editor). Baumgartner, L.J. & Wibowo, A. (2018) Addressing fish passage issues at hydropower and irrigation infrastructure projects in Indonesia. Marine and Freshwater Research Special Issue on Fish and Hydropower. https://doi.org/10.1071/MF18088: 1-9. Colotelo, A., Muller, R., Harnish, R., Martinez, J., Phommavong, T., Phommachanh, K., Thorncraft, G., Baumgartner, L.J., Hubbard, J., Rhode, B., Deng, Z. (2018) Injury and mortality of two Mekong species to turbulent shear forces. Marine and Freshwater Research. https://doi.org/10.1071/MF18126. 1-9. Silva, L.G.M., Baumgartner, L., Deng, Z.D., Fjeldstad, H-P. (2018) Hydropower development and fish management: a food–water–energy nexus requiring international and multidisciplinary approach. Marine and Freshwater Research, 69: i-iii. DOI: 10.1071/MFv69n12_ED. Silva, A.T., Lucas, M.C., Castro-Santos, T., Katopodis, C.,Baumgartner, L.J., Thiem, J.D., Aarestrup, K., Braun, D., Burnett, N., Fjeldstad, H.P., Forseth, T., Pompeu, P., Rajaratnam, N., Williams, J., Zhu, D.Z. & Cooke, S.J. (2017) The top five ways to improve global fishway research.Fish and Fisheries. 1-23. DOI: 10.1111/faf.12258. Kopf, R.K., Nimmo, D.G., Humphries, P., Baumgartner, L., Bode, M., Bond, N., Byrom, A.E., Cucherousset, J., Keller, R.P, King, A.J., McGinness, H., Moyle, P.B., & Olden, J.D. (2017) Confronting the risks of large-scale invasive species control. Nature Ecology and Evolution. (1) 0172, 1-4. Crook, D.A., O'Mahony, D.J, Gillanders, B.M., Munro, A.R., Sanger, A.C., Thurstan, S., Baumgartner, L.J. (2015). Effects of stocking on the population structure and abundance of a native riverine fish. Marine and Freshwater Research. DO10.1071.MF15037. Baumgartner, L.J. (2015). Adaptive management in action: using chemical marking to advance fish recovery programs in the Murray–Darling Basin. Marine and Freshwater Research. DOI10.1071. MF15353. Boys, C.A., Robinson, W.R., Miller, B., Pflugrath, B., Baumgartner, L.J, Navarro, A., Brown, R. (2015). Understanding fish welfare at river infrastructure: A piecewise regression approach to determining barotrauma injury thresholds. Journal of Fish Biology. Forbes, J., Baumgartner L.J., Robinson R, Watts R., Murphy, J., Steffe, A. (2015). Recreational Fishing Effort, Catch, and Harvest for Murray cod Maccullochella peelii and Golden perch Macquaria ambigua, in the Murrumbidgee River, Australia.North American Journal of Fisheries Management 35: 254-264. Brown, R.S., Colotelo, A.H., Pflugrath, B.D., Boys, C.A., Baumgartner, L.J., Deng, Z. D., Silva, L.G.M., Brauner, C.J., Mallen-Cooper, M., Phonekhampeng, O., Thorncraft, G., Singhanouvong, D. (2014). Understanding barotrauma in fish passing hydro and irrigation structures: a global strategy for sustainable development of water resources. Fisheries. 39 (3): 108-122. Baumgartner, L.J, Zampatti, B., Jones, M., Stuart, I., Mallen-Cooper, M. (2014). Fishways and Fish Migration in the Murray-Darling Basin: Not just an upstream battle. Ecological Management and Restoration, 15 (S1): 28-39. Baumgartner, L.J., Conallin, J., Wooden, I., Campbell, B., Gee, R. and Robinson, W. (2014). Linking biological needs with hydrology to develop environmental flow requirements for freshwater fish in riverine systems. Fish and Fisheries, 15 (3): 410-427. Gregory, R., Funge-Smith, S.J. & Baumgartner, L. (2018) An ecosystem approach to promote the integration and coexistence of fisheries within irrigation systems. FAO Fisheries and Aquaculture Circular No.1169. FAO, Rome. Licence: CC BY‐NC‐SA 3.0 IGO. Silva, L.G.M., Bell, K., Baumgartner, L.J. (2018) Clean-up procedures applied to global fish kill events: A review for the National Carp Control Plan. FRDC Project No 2016/158. 61pp. Forbes, J., Steffe, A.S, Baumgartner, L.J. (2017). Preliminary assessment of the Lake Eucumbene summer recreational fishery. New South Wales Department of Primary Industries. Fisheries Final Report No. 156. Sydney, Australia. 38pp. Baumgartner, L.J., Boys, C.A., Gilligan, D.M., Silva, L.G., Pflugrath, B., Ning, N. (2017) Fish transfer risk associated with Snowy 2.0 pumped hydro scheme. ILWS Report No 107. Cresswell, I., Baumgartner, L.J., Bond, N., Brown, P., Chua, S., Cooling, M., Cuddy, S., Hillman, T., Kingsford, R., Lester, R., Mallen-Cooper, M., McGinness H, Nicol S, Nielsen D, Robson B, Stratford D, Webb A. (2017). Scoping the development of a method to assess the relative environmental benefits of Complementary Measures. CSIRO Land and Water, Report to the Murray-Darling Basin Commission. 121pp. Baumgartner, L.J. & Pomorin, K. (2017) The FishNet Database. Institute for Land, Water and Society, Thurgoona. Report to the Australian National Data Service. 6pp. Baumgartner, L.J. (2017) Peer review of Sustainable Diversion Limit (SDL) adjustment – Complimentary Measures. Institute for Land Water and Society, Thurgoona. Report to Department of Agriculture and Water Resources. 16pp. Baumgartner, L.J. (2016). Restoring fish migration. RipRap 39:30-32. Rice, B. & Baumgartner, L.J. (2018) Sharing international knowledge of fish passage in the Lower Mekong. In Brink, K., Gough, P., Royte, J. Schollema, P.P. & Wanningen, H. From Sea to Source 2.0. Protection and Restoration of fish migration in rivers worldwide. World Fish Migration Foundation. Pp70-75 For a download of the book you will need to sign up for your own download link as this link is only valid for one download. Baumgartner, L. (2018) Reducing slope improves small fish passage through a Denil fishway, Presented at the Fish Passage International Conference on River Connectivity, Albury NSW, December 10-14. Baumgartner, L., Boys, C., Marsden, T., McPherson, J., Ning, N., Phonekhampheng, O., Robinson, W., Singhanouvong, D., Stuart, I., Thorncraft, G. (2018) A cautionary tale about the inhibitory effects of gaged culverts on fish passage restoration efforts, Presented at the Fish Passage International Conference on River Connectivity, Albury NSW, December 10-14. VuVi A., Baumgartner, L., Cowx, I., Mallen-Cooper, M., Howitt, J., Robinson, W. (2018) Using otoliths to quantify diadromy in the Lower Mekong Basin, Presented at the Fish Passage International Conference on River Connectivity, Albury NSW, December 10-14. Baumgartner, L.J., Grieve, B., Robinson, W., Silva, L.G.M., Pomorin, K., Thorncraft, G., Ning, N. (2018) Evaluating the placement of PIT tags in tropical river fishes: a case study involving two Mekong River species, Presented at the Fish Passage International Conference on River Connectivity, Albury NSW, December 10-14. Conallin, J., Lunn, Z., Baumgartner, L.J., Thein, H., Chan, N. (2018) The importance of determining and maintaining migration corridors for the Hilsa Shad fishery in Myanmar Inland Rivers, Presented at the Fish Passage International Conference on River Connectivity, Albury NSW, December 10-14. Millar, J., Baumgartner, L., Robinson, W., Homsombath, K. (2018) Listening to local knowledge to inform fish passage and fisheries management, Presented at the Fish Passage International Conference on River Connectivity, Albury NSW, December 10-14. Mallen-Cooper, M., Baumgartner, L., Stuart, I., Zampatti, B. (2018) The challenge of passing small and large fish in rivers with highly variable hydrology, Presented at the Fish Passage International Conference on River Connectivity, Albury NSW, December 10-14. Millar, J., Baumgartner, L., Homsoumbath, K., Phommavong, T. (2017) Changes in the role and management of wetland commons in the Lao PDR: the case of Pak Peung wetland. International Association for Society and the Commons Conference 10-15 July 2016, Utrecht, the Netherlands.